In preparation for the 2019 Regional Bowling tournaments, the KHSAA wanted to notify member schools of the new entry process. 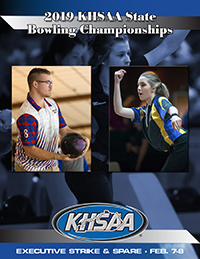 The bowling head coach or Athletic Director for each participating member school should designate student-athletes to its postseason bowling roster on the KHSAA database under the member school system. From that postseason roster, coaches will be able to submit regional entries to the regional manager. Deadline to submit entries is four (4) days prior to the regional tournament start date. A student-athlete must be listed on the postseason roster on the KHSAA website in order to participate in the postseason. New to 2019, BW110 has been converted to an online form. The head coach for each team may submit entries through this form. Entries will automatically be sent to regional managers to make final arrangements in regards to schedules, lane assignments, etc. BW110 will accept entries for girls/boys individuals as well as boys/girls teams.